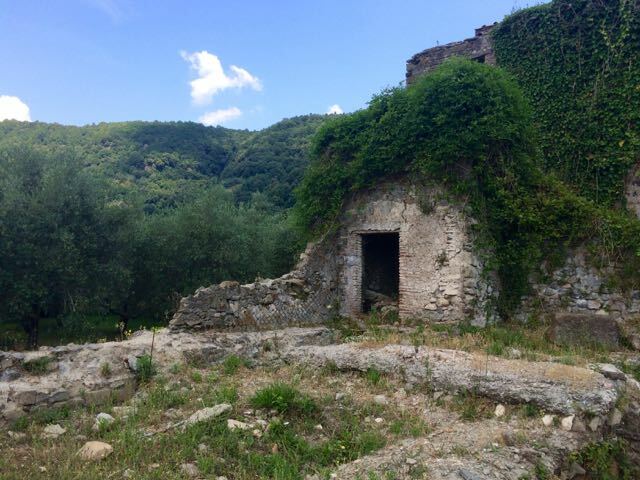 About an hours drive south of the city are a collection of towns called the Castelli Romani where Romans have been escaping the heat and chaos for centuries. 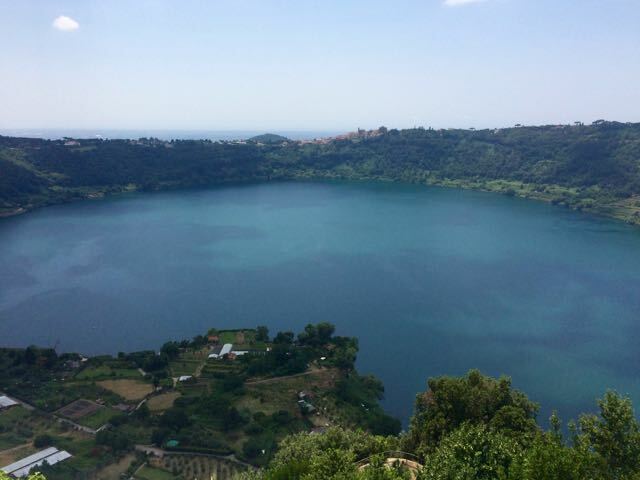 Nemi has a deep sapphire blue lake and was once home to an important temple to the goddess Diana. 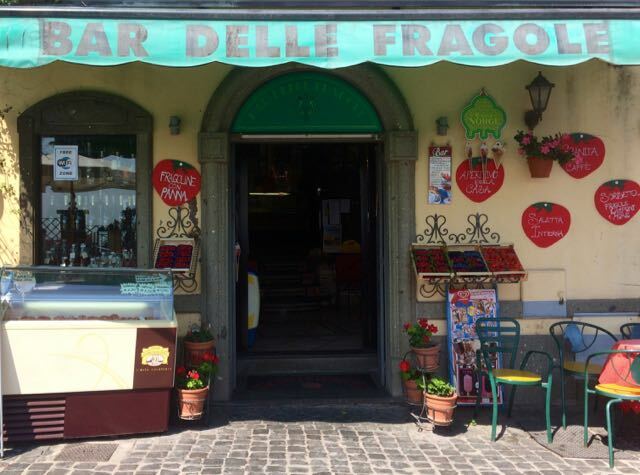 the other cool thing in Nemi. The Emperor Caligula built enormous ships more like palaces than transportation, that floated on the lake. 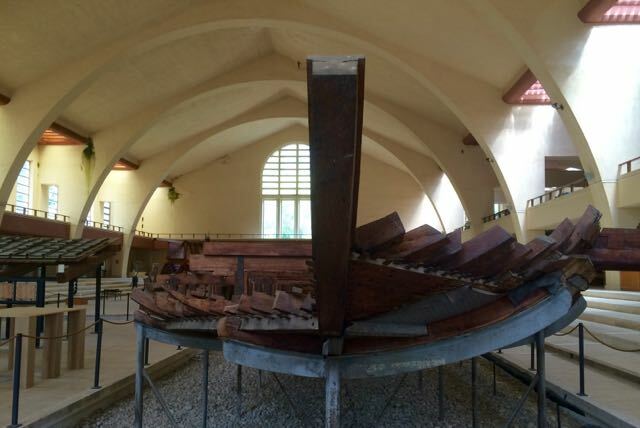 Our first stop was the Museo delle Navi Romane which was blissfully empty and extremely well curated. 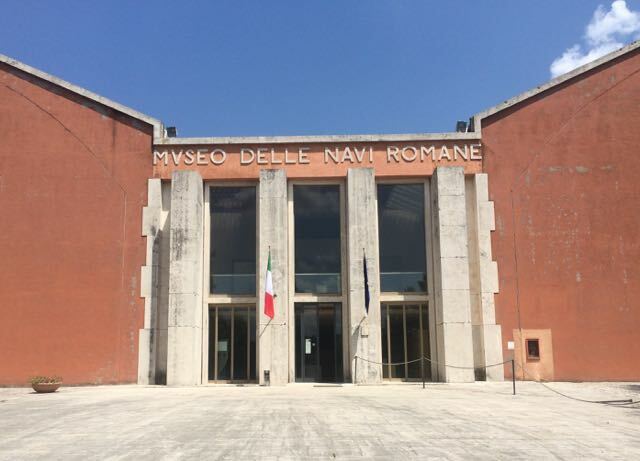 We learned how Mussolini had the lake drained and the boats raised and restored (Reproductions created from remnants are in the Palazzo Massimo in Rome)and read about the ancient temples in the area. My pal Sarah who lives nearby suggested we go see the ruins of the temple of Diana. On her instruction we followed a small road and found a picnic spot with lots of sweet, friendly dogs and fountain flowing with cold effervescent water. We explored the spot where a few thousands years ago devotees left votive offerings to Diana. When it was time for lunch, we drove to the town of Nemi which sits high above the lake and has impressive views and more importantly a cool breeze. We walked through the small historic center to the edge where there is a scenic overlook. I had uncharacteristically not done any restaurant research so we picked a place for the view and the breeze. 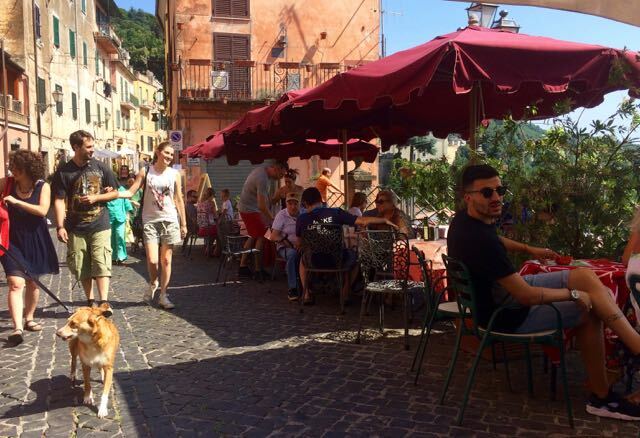 It was only once we sat down that I checked on Tripadvisor to discover it had been declared the absolute worst restaurant in all of Nemi. Happily that was not our experience and we had a good meal of local pasta dishes with mushrooms, a plate of cicoria and a very cold bottle of a local white wine all served with gruff but funny Roman-style service. 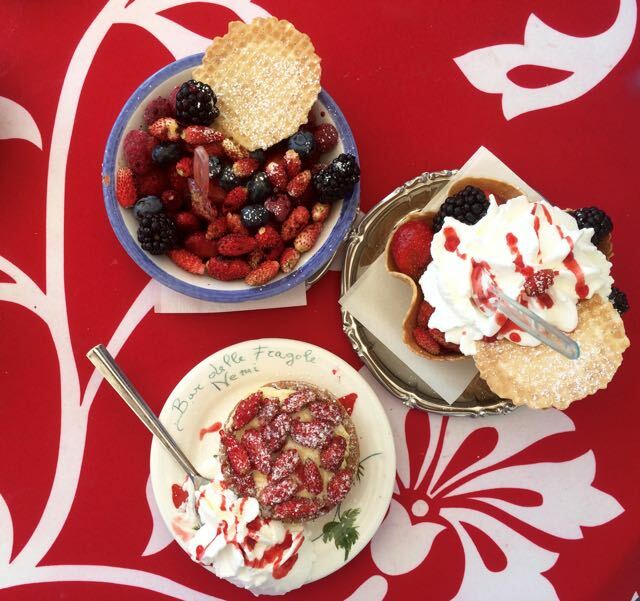 Nemi is famous for it's strawberries so our last stop was at the Bar Fragola where we sat in the shade and looked out over the lake far below and ordered as many kinds of strawberry dishes as we could eat. 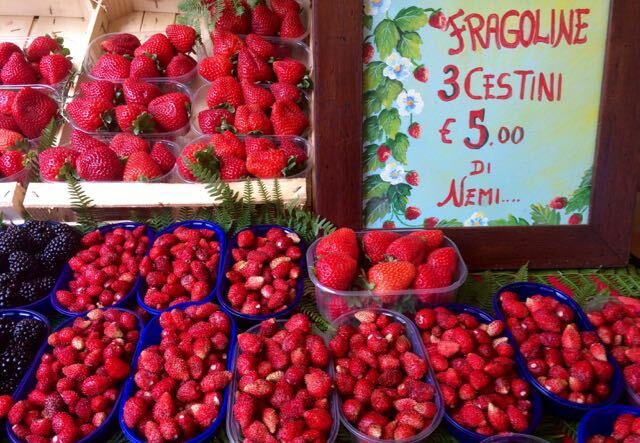 The strawberries here are a special wild variety called Fragoline di Bosco that are grown on the slopes of the ancient volcanic crater. 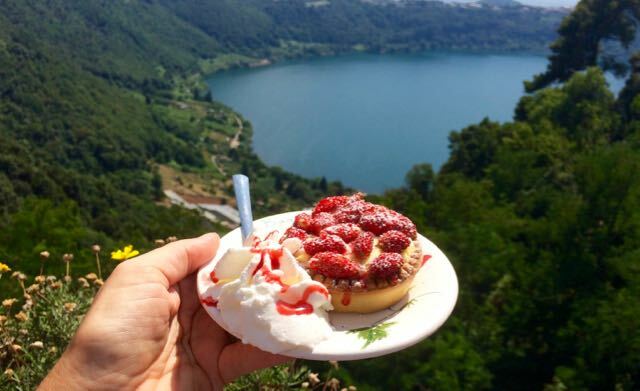 I had the classic strawberry tart, which had some of the best pastry cream I have tasted. Noah chose a large bowl of Fragoline, normal strawberries, blackberries and blueberries all doused with balsamic vinegar. Mark had the same mixed bowl of fruit toped with whipped cream. We reluctantly left our breezy strawberry perch and walked slowly back to the car to return to our Roman inferno refreshed after a few hours of cool relief. Thanks Elyssa! I could really go for another one of those tarts right now!